The Djormo Dance Ensemble was formed in the 1995 with the sole aim of promoting the culture of Ghana to the international community. As part of its activities the group also seeks to develop the talent of young and brilliant community drummers and dancers who want to pursue a career in performing arts. Over the years the group has participated in both local and foreign events all with the aim of promoting the culture of Ghana and also preaching peace to its audience the world over. The Djorma Dance Ensemble will be performing at the SDG Action Awards Ceremony on 2nd May, at the SDG Procession on 3rd May, and will be hosting a drumming workshop on Saturday 4th May in the Plenary Hall. 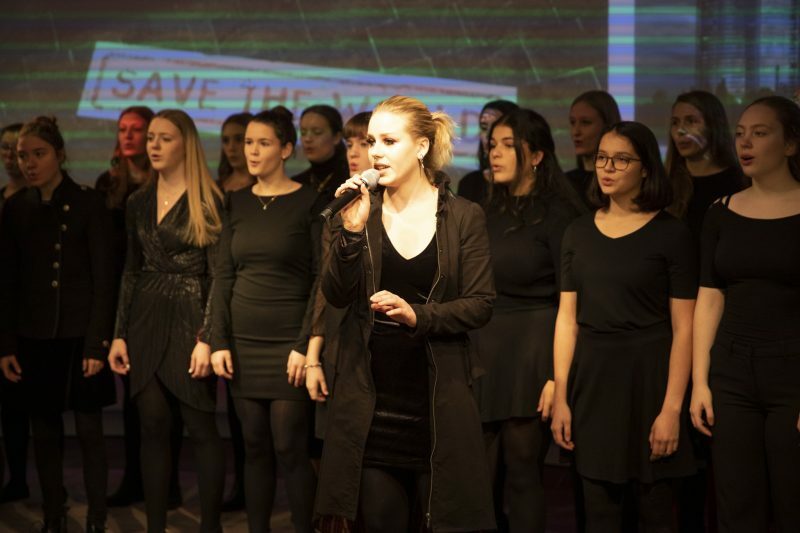 On behalf of SAVE THE WORLD 2018, songwriter Bernadette La Hengst has created the new climate song I NEED AIR together with the Youth Choir of Theater Bonn, previously launched as a cultural contribution to COP 24 in Katowice. The song, the fifth climate changed-linked chanson written by the musician on behalf of SAVE THE WORLD frames the urgency for climate action through the lens of clean air. The song is featured in a music video which was shot on the streets and among the buildings of Katowice with the support of the City of Katowice. SAVE THE WORLD is an artistic initiative started by Nicola Bramkamp and Andrea Tietz, which combines scientific expertise with artistic performances to spread the SDGs. SAVE THE WORLD believes artists everywhere have an important role to play in mobilizing awareness and action on what is happening in society and across the globe. Climate change is not a simple, single issue but one that cannot be ignored and must be addressed. I NEED AIR will be performed in the closing plenary on Saturday 4th May.